Thinking of trying Scuba Diving? Well if so, I highly recommend it! Snorkeling is great fun but there is nothing like being down there with the fish. The difference is like looking at an aquarium vs being in the aquarium. It’s important when you’re interested in any new hobby, that you research it carefully. Scuba diving, like many hobbies or sports, can be dangerous but also well worth the time and money invested to do it right. Scuba diving – whether in a simulated pool environment, just off-shore, or open-water – needs to be taught by certified instructors. What Does an Entry Level Certification Cover? Where are you going to or want to dive? Where are you going to be taught? Are there certified instructors nearby to teach you? Online research can show you the places that are available for the type of diving instruction you want, where they are located, as well as the ratings and reviews they’ve received from other professionals and students. Take all of this into consideration when ranking the places you’d most like to go, and then call them. Or better yet, go there to see those places in person so you can experience the customer service and view the facilities. Take notes. Let them know you are shopping for a place for instruction and that you would like to know what they offer. Yes, you will get a sales pitch, but there is a lot to learn from how they pitch to you as well. Are you a potential lifelong customer or a credit card swipe to them? Only once you have seen your potential picks, you can make your decision and commit to becoming a Scuba diver with a reputable school. To check to see if the school you choose hires instructors that have a PADI (Professional Association of Diving Instructors) Membership, you can check their membership number – which they should gladly give you, or it should be visible on a certificate shown at the front desk – you can go to PADI Pro Chek. At this site, when you enter the member number, you will be told a lot of information about that PADI member. You will be told the name associated with the number, in case the name did not match the name given to you as being attached to that number at the school. You will also be told their highest professional PADI rating achieved. The final two things that you will learn is the current status of their membership – whether it is up-to-date or has lapsed – and when it was last renewed. To renew your license with PADI, you need to also keep up on your training, as skills deteriorate over time, and new techniques are learned all the time. You need a bit more information about the instructor to see if they are certified with NAUI (National Association of Underwater Instructors). You will need their first and last name, along with date of birth. If you make it clear you are asking for this information to verify that they are, indeed, a NAUI certified instructor, they should have no problem giving it to you. After all, if they are current, they want you to know so that you come back for instruction. You can verify their certification right on the NAUI site. Getting an entry level certification in Scuba diving is very different whether you get it from a PADI instructor or a NAUI instructor, but what that certification covers is pretty similar. Both certifications are accepted world-wide and allow dives up to 18 meters (60 feet). However, with a PADI certification, you must always dive with a PADI certified professional diver. When you have a NAUI certification, you can dive alone as long as the dive you are doing is similar or easier than those done in your instruction. A PADI or NAUI entry level certification lasts for life. You can get one or both. It’s very important to have all of the proper equipment for any sport or hobby and, once again, Scuba diving is no exception. Here is the equipment you will need to either buy or rent. You don’t need to buy everything at once. I recommend just starting off with a quality dive mask, and fins and go from there. Dive Mask and Snorkel: A dive mask creates a space between your eyes and the water allowing you to see clearly while you’re diving while also helping your ears and sinuses equalize the pressure as you dive. The snorkel attaches on the left side of the mask and is optional but good to have. Primary Regulator: This piece attaches to your air tank and pushes air to you when you inhale. There is also a secondary regulator that is your back-up in case your primary malfunctions. The ‘octopus’ as it’s called is always bright yellow so it can be found quickly in case of emergency. They are both routed to your mask on the right side of your body. Wetsuit: They come in two types, wetsuits and skins. Wetsuits are typically made of foam neoprene rubber and are thicker than skins, which are typically made from spandex or Lycra (though some come with linings). The importance of a wetsuit is for protection against water temperature as water lowers the body temperature 20 times faster than air. Skins may protect you from scratches and abrasions but they will not help control your temperature. Know the temperature where you’re diving to ensure what type of suit you need. However, the most important part is fit and comfort. Dive protection gear should fit properly (which is snugly) without restricting movement or breathing. 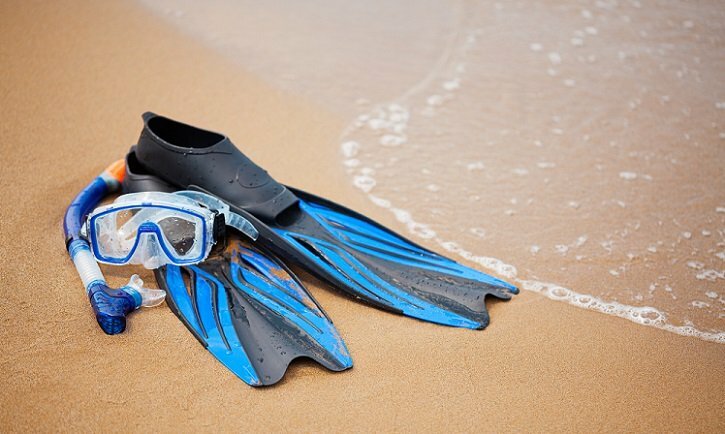 Fins: Choosing the right dive fins can make a big difference in your diving experience. Water is 800 times denser than air so it takes strength and conditioning to move around. Fins basically translate your leg muscle movements into power that helps you move through the water. There are several different types of fins in terms of size and rigidity. Experienced divers with strengthened leg and hip muscles would do fine with a longer, more rigid fin while a new diver would be better to choose a lighter, more flexible fin. There is also the choice between open heel fins and full foot. Open heel fins require the use of a bootie. The most important feature though once again is fit. Properly fitting fins will fit snugly while not binding your foot in any way. Just like a comfortable shoe, you should be able to wiggle your toes in them. Tank: The Scuba tanks, also known as bottles or cylinders, are the most important part of your dive equipment because they contain the air that will keep you breathing underwater. Because of this, they must be checked regularly and those codes on them must be kept current as they are inspected, because then no reputable dive shop will fill them with air for you. This is the exact same thing with fire extinguishers in your home. You wouldn’t want one to fail in an emergency so you check them regularly. Buoyancy Control Device (BCD): Often referred to as just the ‘BC’ is one of the most important pieces of your dive equipment. The main use of your BC is to assist you moving in the water. You can control your position by either adding or releasing air in the system. The unit will allow you to achieve neutral buoyancy at any depth. It fits just like a backpack and attaches to your air tank. Look for one with quick release buckles and adjustable straps that feels snug but not tight. It’s always best to try the one you’d like to purchase on with the wetsuit you use most often to test for fit and operational ease. Make sure you check over the inflator hose to ensure it will reach over your head. Are the inflate and deflate buttons clearly marked so they are easily differentiated with one handed operation? Weight Belt: A weight belt helps a diver get to their chosen depth at a smooth pace, maintain that depth, and stay even in the water by adjusting where the weights are on the belt. It is very similar to the BCD but this is a little simpler to use once in the water. Before you get in the water, however, there is some math to be done. You will have to calculate your weight, your wetsuit, the depth you wish you stay buoyant at, your tanks (as they are heavy but also filled with air), and also your experience as a diver. 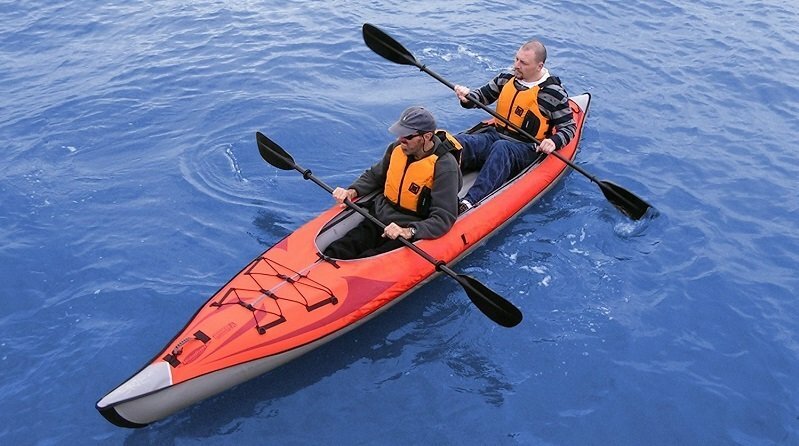 You must know how to adjust the belt to be able to maneuver in the water. Submersible Pressure Gauge (SPG): The SPG measures how much air you have in your tanks so you know when to safely end your dive and start your ascent without running out of air. There are two types of Submersible Pressure Gauges: analog and integrated. The analog ones are what you would typically see with any traditional gauge. It would have a face with numbers and a needle which would show you how much is left in the tank. It would be up to you to determine how much time that amount of air would last you for an ascent. The integrated SPGs are combined with dive computers or any other instruments you may have with you while under water. SPGs are also known as air gauge console, integrated computer, pressure gauge, or instrument console. Dive Computers: The good thing about a dive computer is that there are ones for every price range. You can start out with an entry-level one and upgrade as you get more into the hobby and your skills increase. Basic Scuba diving computers will tell you depth, direction, and have a tank gauge. Then there are significantly more advanced ones that even give you access to upgrades over time so you know you won’t have to buy a whole new computer when it is time for a new one, you just have to upgrade the software. Because these are a big investment, and worth the money you spend, make sure you do your shopping around and talk to your dive instructors and fellow divers before deciding on one. Misc Equipment: There are a few more optional pieces of equipment for you to consider. A dive light is useful for not only diving at night but looking in crevices to see marine life. A dive knife is always a good idea to have in case you get tangled in fishing line or nets. Last but not least is a camera to take pictures of all the fish and marine life you will get to see. There are many fears that people who are interested in Scuba diving claim keep that them from looking into the hobby further or trying it for themselves to see if they would really like it. Some therapists use Scuba diving, in particular, to help people face and overcome their fear of confined spaces or of the dark, for example, but people can do this on their own without a therapist’s recommendation. You just have to make sure that your instructor is aware of all of your fears before you sign up so that they know if they are the right instructor for you, and if the locations in which they commonly do their certification dives will be suitable. Galeophobia – Fear of Sharks: Most of the fear of sharks has been stirred by pop culture films, such as the famous Jaws series, and the media, that make shark attacks at beaches out to be something much more than they are. In fact, when we look at who was here first, the sharks were. And with modern technology, we have been able to learn about all of the various types of sharks, where they migrate from, go to breed, and tend to feed. With this information, we can know with a high degree of accuracy, what waters to stay away from during what parts of the year when it comes to sharks. Claustrophobia – Fear of Confined Spaces: This fear, while most people say that they are feeling claustrophobic in a certain situation, means that you have this irrational fear all of the time. If you were truly claustrophobic you would fear being in a plane, in a small room, in an elevator, or a crowded conference hall at all times and if the idea that something like that might happen, then your anxiety level would skyrocket even more. When Scuba diving, you are completely surrounded by water and you can’t just swim as fast as you can for the surface when you feel that anxiety. It takes calm breaths and a calm mild to keep from feeling this way while diving, especially if you are prone to claustrophobia. Agoraphobia – Fear of Being in a Place that Will Cause You to Panic: If you’ve already had a panic attack before, or maybe even several, and you avoid the places or activities that caused them or maybe any place or activity that you feel might cause another one, then you may suffer from agoraphobia. This fear is commonly seen in people who are claustrophobic and have had a panic attack in a confined space before, or who have attempted to dive before and had a panic attack under water, whether they were in the training pool or on an actual dive. Some people get anxiety just by being in the wetsuit and having the gear on, because it can be constricting and breathing through the regulator is not a normal feeling, especially when you know you can’t just take it off while under water. This is a fear that takes the most time, and the gentlest instructors, to be able to get a diver to be able to get that certification and comfortably dive. Nyctophobia – Fear of the Dark: Most people don’t actually fear being in the dark. They fear what could be in the dark or happen to them in the dark. These fears usually come about from stories, movies, hearing things from friends, or even watching TV shows. However, you find out about “what may be lurking in the dark” and whether or not it is a rational or irrational fear depending on where you are and when, you need to understand that your first dives will be during daylight, and no deeper 18 meters or 60 feet, so it will still be plenty light where you are. It’s important also to recognize that if you do decide to go on with other certifications and learn to dive in low or dark light, there are tools at your disposal so you won’t be diving blind. Aquaphobia – Fear of Water: This is an irrational fear that can be mild, meaning you just don’t like swimming in the deep ocean or going out on a boat even with a life jacket on and knowing the fact that you can swim, to much more severe that you don’t even like dealing with the water in the bathtub. Most people who suffer from this phobia don’t like being splashed unexpectedly and certainly don’t like being thrown or pushed into a pool or other body of water. Whether it is mild or more severe, learning to safely Scuba dive can make people with aquaphobia much more relaxed around water because they know how to deal with being submerged, as well as swim, and being splashed. It may not get rid of the phobia, but it can help it become more tolerable. As mentioned earlier, you need to make sure your instructor (or all instructors, if there are more than one) know of the phobia so that they can help prepare you with mental sayings you can give yourself once in the water if you feel yourself starting to get anxious. Also, they will give you a hand signal specific to that, telling them that you need help. They can walk you through with hand signals that you will learn in your classroom training before even getting in the water, and if that doesn’t work, they will bring you up calmly. Knowing this before you get in, and being reassured by the instructor, will help you to feel more confident once diving. An instructor will help, but it’s important for you to know how to help calm yourself as well. Use a calm breathing technique by simply breathing in with a count of 5 and breathing out for a count of 5. Repeat a mantra telling yourself you are doing something you have always wanted to do or accomplish and that you are succeeding, no matter what your brain is telling you. Combine the mantra and the breathing technique. Listen to the sound of the regulator if you need something to focus on outside of what your brain is telling you and you can’t get yourself to focus on your mantra. If these things don’t work, use hand signals to communicate with your instructor, but do not wait until it is too late and you are panicking. The most common discomforts when scuba diving are squeezes, which is just pressure on the middle ear between the goggles and the water. This is something that rarely goes into the inner ear, but if it does, it can be a little more serious and will be discussed below. Another thing that most novice divers run into is scrapes or cuts on marine life, like fish or coral, or on debris like wrecks or fishing gear. However, there are several medical conditions that you can run into if you’re not cautious and you don’t watch what you’re doing. If you think you have one of these, you should seek medical help right away. Decompression Sickness (“The Bends”): If you ascend too fast, then nitrogen stored in the body as a solution in tissues and the blood turns into bubbles. These bubbles can damage tissues – sometimes permanently – and can block blood vessels, which can be very dangerous. The three easiest to recognize signs of the bends include reduced or lack of function of the lungs, spinal cord, or brain. Arterial Gas Embolism (AGE): AGE also involves nitrogen bubbles, but this time the bubbles aren’t damaging blood vessels and tissue, they are entering the blood stream and heading for the brain. This is a very serious diving medical condition and needs to be treated as soon as possible so if any of the following symptoms occur after diving, go to the nearest hospital: tingling or numbness of the skin, partial or full paralysis, or loss of consciousness. Pulmonary Barotrauma: Pulmonary Barotrauma usually happens for one of two reasons: 1) improper breathing during ascent, or 2) diving with an infection in the respiratory tract. This is a less serious medical condition caused by diving as it usually only causes a bit of shortness of breath, some chest pain, and some hoarseness. Inner Ear Barotrauma: This is very similar to what you experience when you fly in a pressurized cabin and you “pop your ears” or when you are driving through the mountains and the changes in altitude cause pressure in your ears. Doing this often enough can cause dizziness or hearing loss. There are many things that people can do to increase their safety in many situations and diving is just one example of that. When riding a bike, you wear a helmet to protect you. When in a car, you wear a seatbelt in case of an accident. So what are some of the things you can do to increase your safety when scuba diving? Don’t Dive if You’re Not Comfortable: If there is anything about the circumstances that make you uncomfortable about the dive, then don’t do it. If you don’t feel you’ve studied enough about the area and you’re not ready, then don’t do it. If you are with a new dive partner and you don’t feel you know each other well enough for a dive this complex yet, then don’t do it. If you are a little unsure of the water conditions, then don’t do it. If you have any reason at all to not feel comfortable with diving, then don’t do it, even if it’s just a gut instinct. Always Have a Dive Buddy: It is always recommended by both PADI and NAUI that you dive with a buddy, even if you are an advanced diver. Another diver may be able to spot something you haven’t, or alert you to a danger in the water so you can both get to safety. If one of you is injured, then the other can help. And while it’s always important to have a dive buddy in the water with you, always make sure that there are people on land that know where you are going to dive and when so that if something happens and you make it out of the water but you can’t contact anyone, they know where to start looking for you. Never Hold Your Breath While Ascending: Because of the various medical conditions mentioned above that can be caused by improper breathing while ascending (no matter what depth you were at when you started) you need to remember to breath properly, and if you were at a deeper depth, you need to remember to stop at intervals to let your body adjust to the pressure while you just breathe. Many diving medical conditions can be avoided so take your time and remember to breathe properly and ascend slowly. Be Observant of Your Surroundings: As mentioned above, one of the most common injuries to divers is cuts and scrapes on things underwater. It’s important to be observant of what’s around you so that you can stay out of harm’s way. Not only can you harm yourself on coral or a fish with a spiny fin or fishing debris or a wreck, but there are also living things underwater that may want to harm you, so make sure to keep your eyes open in all directions so you can get to your boat or to dry land if something like that is close by. Never Panic: Even if something potentially dangerous close by, you should never panic. You need to remember that the important thing is that you get to safety. If you keep that thought first and foremost in your mind, without thinking about WHY you need to get to safety, then the panic will lessen or stay at bay. Also, the techniques mentioned above about staying calm when anxieties are present will help when it’s not a dire situation and your dive buddy can help with this, especially if they know about what anxieties you have. This is yet another reason to always have a dive buddy present. “Always plan your dive; then always dive your plan.”: This is the motto of all seasoned divers and it will soon become the motto of the next wave of divers who learn what it means. You need to plan your dive. You need to know what it’s like down there. Ask people who have dived the location, look for pictures online, and look up seafloor maps of the location. Mark out where you are going to dive, what route you will take, what you will see, and how you will get back. And then ALWAYS stick to that plan. Check All Dive Equipment Before Use and Double Check That It Can Handle the Dive: These checks should be done before leaving for the dive location as well as while you’re on the boat on your way out to it. Double and triple check to make sure that all equipment is fit together properly and is working, that all gauges read properly, and that oxygen is flowing. Also make sure that you are wearing the proper suit for the temps, that you have the proper tank or tanks for the time you will be under water and the depth, and that you have a gauge so you know when it’s time to start your ascent if it’s not a quick dive. Don’t Drink Alcohol or Take Medication Before a Dive: Alcohol can cause serious problems by thinning your blood and making you lose consciousness underwater. Even if you don’t, it can cause you to make poor decisions which can lead to other injuries or medical conditions. Some medications are okay to take before a dive and actually shouldn’t be stopped because of medical reasons so it’s important to talk to your doctor whenever you are going to Scuba dive so that he or she knows the circumstances of the dive and can stop or adjust your medication accordingly. Ask Your Doctor About Your Health Problems Before Scuba Diving: Diving can have an effect on other aspects of your health if you already have health conditions so it’s important to ask your doctor if he or she thinks you should do it, or if you have depth or time restrictions. They may also have you come in for a physical both before and after your dive to make sure you are still as healthy as you were, and if you are then you may be given the green light for future dives without coming in or asking. No Cave Diving Unless Properly Trained: Cave diving is something that should only be done by people who have been trained to do so by other professional cave divers and who have been briefed on the conditions of the caves before they go under. Many underwater cave systems are mazes and it can be very dangerous to get lost in there if you don’t have some kind of mental map as to how to get back out, or if you don’t have a team of cave diving buddies to help find a way out. Some vacation destinations or cruise lines offer a “Discovery” PADI certification that is done in just a couple of days that is usable that is limited in what you will be able to do. However it will give you a good idea if your going to like Scuba diving before you go for the Open Water certification. You will still get the same proper classroom time, time to learn the equipment and how to use it both above and below the water, pool time practice so that you are comfortable in the ocean, and then real dives to be able to qualify for certifications. With this certification you will get some credit once you get back home to get a complete PADI or NAUI certification as you’ve already completed much of what you need to do, plus you’re already comfortable with diving. Other vacation destinations will not give a certification, but they will still do the classroom and pool time training that you need, plus make sure you are comfortable before getting in the water. There will be plenty of instructors and professional divers with you on dives to make sure that you are safe. These dives won’t count toward any certification, but you will still have a lot of fun! So if you’ve gotten your entry-level certification from either or both PADI or NAUI and you are looking to get deeper into the hobby, and by that, go deeper underwater and experience more of what the ocean has to offer the recreational diver, there are advanced diving courses and certifications you can get. Now, even if you have the lifetime entry-level certification from PADI or NAUI, you may be asked to do a “checkout dive” by a rental company or by a resort if you are trying to rent equipment. PADI Advanced Open Water Diver: This certification will allow you to dive up to 130 feet instead of just 60 feet. You will have additional classroom time and five more dives. One of the dives must be a navigational one and the other must be a deeper one of between 60 and 100 feet. As for the remaining three dives, you can choose how to take them. You can do them off of a boat, do some underwater photography, or it can be another navigational dive to get extra practice if you plan on doing more of that. NAUI Advanced Scuba Diver: The Advanced Scuba Diver Certification from NAUI opens up possibilities for a whole new world of opportunities under water for divers. With this certification you can begin to be exposed to the basics of search and rescue, you can start using dive computers, you can learn more about underwater photography, observation, and data collection, plus much, much, more. This course will allow you to go on dives that are of particular interest to you with a certified instructor. SSI Advanced Adventurer: To get started with instruction as an SSI Advanced Adventurer, you must already have an SSI Open Water or a PADI Open Water certification. Then you will have classroom training on each of the 5 types of adventures you will go on. This training is a way for you to find out what type of certifications and trainings you want to continue with and which ones you don’t, so it’s really about learning what suits you best. The five types of dives you will go on are deep diving, boat diving, shark diving with fish identification, wreck diving, and digital photography diving. CMAS Two Stars: To obtain the CMAS Two Star Certification, you must already have a One Star Certification (also known as a Bronze Certification), an orientation course, a leadership course, a Medic course, and at least 25 dives at the Bronze level. You will then take an Immersion Theory course, and an ABC Diving Practice Course. For open water dives, there are 6 in total and they each have instructions on what needs to be done on each to prove you have learned from your previous certification and new learning. There are guidelines on who a CMAS Two Star certified diver can dive with and up to what depth. BSAC Sport Diver: This certification is a great way to increase the depth at which you feel comfortable diving, to learn how to dive in increasingly difficult situations (such as low light or murky water) and just to get more dives under your belt. The depth progression is done gradually so you aren’t thrown in and asked to dive from 60 feet to 100. To do the progression, you must be 14 years old. You can do it if you are at least 12 years old if you have taken the BSAC Ocean Diver course or a course from another agency like PADI or NAUI that also qualifies. It’s very important to always practice just to keep the information you learned in your training fresh in your mind. If you want to go for a dive and you don’t feel your sharpest, then take a refresher course or ask your dive buddy to go over things with you if he or she has gone out more often than you have. If your Scuba equipment has been sitting in the garage for a while, you need to check it regularly or better yet bring it to a dive shop and have them look it over. If you have any doubts, then replace it. You don’t want to have to go rushing out to replace it at the last second because you’ve been invited on a dive and you get on the boat and you find out your gear isn’t working. Keep your equipment in good working order. If you ever have any questions at all, always ask a master diver. Most rental shops and instruction schools will have a master diver on hand to make sure people who have questions get proper answers and they are usually more than willing to help, especially because it means that someone’s safety is involved. Talk to them before you take a class to see if it’s something you want to do, talk to them during the class if you are nervous, and talk to them afterward to get feedback on how you did so you can improve even if you did get your certification. Always ask questions. Now that you know how to get certified, you just need to find a place to go scuba diving, there are many 5 star PADI resorts to choose from, just be sure to do some research before booking your trip.